Winnipeg is home to FortWhyte Alive: a nature centre, wildlife refuge and education facility housed on 640 acres of urban green space. 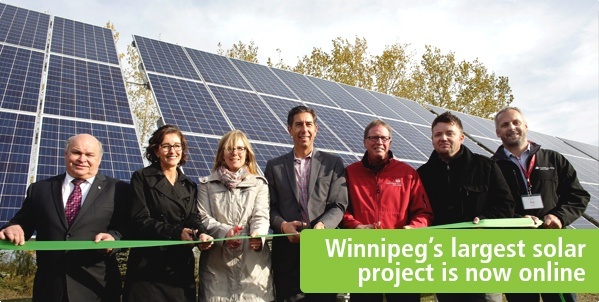 In October, FortWhyte unveiled the largest solar project in the city: a 60 kW installation made possible with support from Bullfrog Power and Investors Group, a bullfrogpowered customer. The project will generate enough solar power to match 50% of the electricity usage at FortWhyte Farms. In partnership with Beau’s Brewing Co. (who is bullfrogpowered! ), and on behalf of the bullfrogpowered community, Bullfrog supported the launch of a 10 kW rooftop mounted solar system for Ottawa-based Just Food, a grassroots non-profit working to promote and ensure local food security. The solar array will help lower the costs of Just Food’s sustainable farming education and food equality initiatives. Founded 50 years ago in Lethbridge, Alberta, Flexahopper Plastics celebrated its anniversary with the launch of a 508-panel solar installation on the roof of its northside factory—the 164 kW array will provide up to 40% of the building's electricity needs. Flexahopper is also one of Bullfrog's longest-standing customers, having signed on in 2007. Congratulations! In its latest blog post, Bullfrog partner Clean Energy Canada examines the global trends influencing the long-term future of renewable energy in Canada. Clean Energy Canada's Merran Smith writes: "We need to understand two things that make this global energy transition different than any that has preceded it. First, the role of China. And second, the forces that are accelerating change." Read the full story. The Jane Goodall Institute of Canada is bullfrogpowered! Founded by renowned primatologist Jane Goodall, the Institute’s mission is to protect great ape populations through community-centred conservation and to empower new generations of committed, active citizens around the world. Learn more about the Institute’s mission. Muskoka Roastery Coffee Co. is now bullfrogpowering its roastery and showroom in Huntsville, Ontario. The roastery's coffee blends are inspired by and named for the beautiful Muskoka region—and they are proud to be the first roaster in Canada to source green beans exclusively from Rainforest Alliance Certified farms. Muskoka Roastery also donates 1% of annual sales to environmental organizations like the Muskoka Conservancy, and to those in need through Food Banks Canada. Learn more about Muskoka Roastery in our blog post! Planet Explorer, developed by bullfrogpowered Planet Labs Geomatics, is a web interface that lets users search and browse a historical satellite image archive of the earth! The application is designed to make daily satellite imagery more accessible to customers, researchers and the public. Click here to learn more.